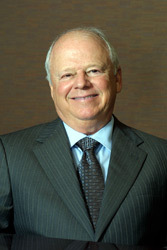 Attorney Profile, Walter E. Smith - Meros, Smith, Lazzara, Brennan, Brennan & Olney, P.A. Walter E. Smith received a Bachelor of Science degree from Ohio State University in 1968 and Juris Doctorate degree from Stetson University College of Law in 1971. He is admitted to practice before the Florida Bar, the Ohio Bar, United States District Court, United States District Court of Appeals, and the United States Supreme Court. He has been Board Certified by the Florida Bar in Civil Trial Law since 1983, and is also Board Certified in Business Litigation Law, and is a Supreme Court Certified Circuit Civil Mediator. Walter practices in the area of personal injury, insurance defense, business litigation, construction litigation, real estate litigation and arbitration. He, together with his staff, handle residential and commercial real estate transactions. He also has an extensive mediation practice. Walter was born in 1947 in Cincinnati, Ohio. He and his wife Heather were married in ­­­ 1979 and have four children, Todd, Kristen, Melanie and Jennifer and 7 grandchildren.